Open format office spaces have become a signature design choice for today’s office buildings. They are meant to foster collaboration and increase transparency: to bridge the gap between supervisors and their employees and to bring workforces closer together. Research has suggested that open office formats do contribute to productivity when they are done correctly, but they have also led to some unforeseen consequences. Optically clear glass materials provide a solution to those challenges. In past decades, employees were sectioned off into cubes or closed offices, blocking them from the view of their coworkers. The cube format eventually became an object of ridicule. It was also said to have a negative effect on happiness and productivity, leading to disgruntlement. Studies have shown that most workers are not happy with cube set-ups. The open office was pioneered as a solution to the cube problem. But in an open office format, the constant chatter of other employees, the sounds of people typing and even the noise from people walking across the floor can become distracting. According to one survey, 58% of high-performing employees said they needed more quiet spaces to do their work. Junior employees also reported that open office spaces make their workdays more stressful because their supervisors are constantly over their shoulders. Sometimes, individual employees and teams need secluded spaces to brainstorm, collaborate, and focus on tasks. Many businesses accomplish this by creating walled off conference rooms, but even these contribute to employee stress by creating an atmosphere of exclusion. The challenge lies in fostering employee happiness and collaboration while also providing employees with the privacy they desperately need to perform. Glass media fixtures, such as walls and partitions featuring optically clear printable media, provide an innovative solution to the open office question. Glass media is often sought after for its marketing purposes. Vinyl decals and glass printed logos are a common sight on storefront windows and in shopping malls. But optically clear printable glass media is much more versatile. It can incorporate many of the branding and design elements of other glass media while acting as a functional barrier within the office. Creating collaborative spaces like conference and meeting rooms with clear glass is an option, but clear glass removes any modicum of privacy. 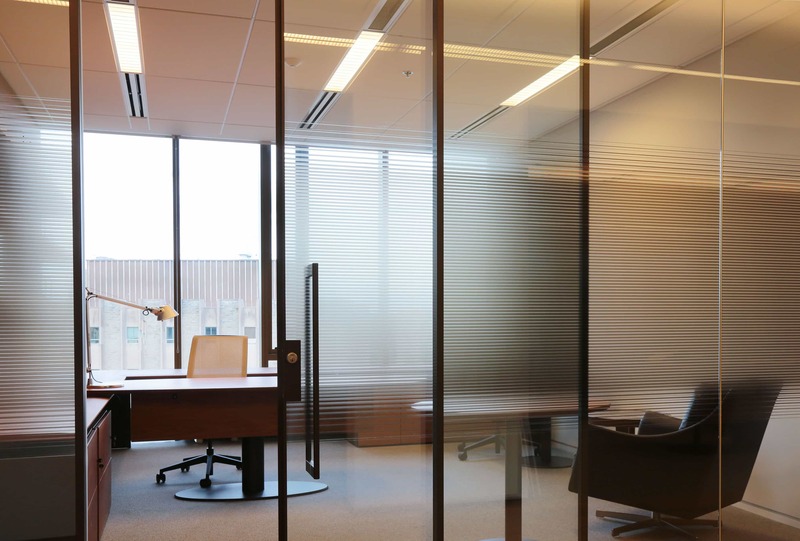 Optically clear films for glass surfaces give offices the ability to offer privacy and transparency at the same time, without creating a “fishbowl” effect. Glass walls, separations, and doorways bounce sound and keep conversations private. Monolithic glass, laminated glass, and double glazed glass units can be used to dampen noise and eliminate acoustic effects within collaborative spaces. But the most significant benefit to using optically clear glass film is the ability let light in. Allowing natural light to permeate an office environment can have a positive influence on employee mood and performance. According to one study by the American Society of Interior Design, 68% of employees complain about the lighting situation in their office spaces. Creating naturally illuminated spaces using optically clear glass can let natural light in while also dampening its intensity during certain hours. Demountable interior glass structures allow property managers to partition their office spaces as they see fit. Optically clear glass materials also offer a number of unique branding opportunities. Glass prints can be colored or colorless, generic or brand-specific. Offices can create designs that speak to the nature of their company or use designs that deliberately influence mood. For example, an architect or interior designer working with a company that is about to inhabit an office space may wish to incorporate that company’s logo into the exterior glass of the building. Using optically clear glass materials, the brand labels on windows wouldn’t dampen incoming natural light to the point that it negates the function of the window. In the face of increasing environmental concerns, architects, designers, and printers are searching for alternatives to traditional printing products. PVC, or polyvinyl chloride has been used in glass films, prints, and other building materials for decades. There are now optically clear glass printing materials on the market that are free of PVC. Optically clear polyester printing products are produced with a proprietary print receptive coating that accepts eco-solvent ink. High clarity, non-PVC polyester films are also available for window decoration in permanent and non-permanent forms. Environmentally conscious corporations, green architects, and sustainable printers will quickly migrate to these new products to create safer, more sustainable office spaces. If you take a long look at Apple’s new “Spaceship” headquarters or Tencent’s new building in Shenzhen, you’ll see immediately that glass is playing a starring role in the workplace constructions of tomorrow. Windows, glass walls, and inter-office partitions are all blank canvases waiting to be explored. 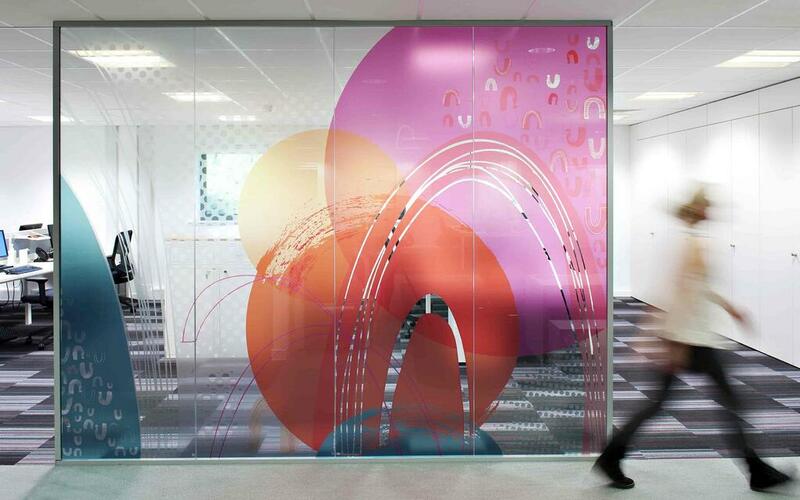 With new materials that are friendlier to the environment and have a range of design applications, optically clear glass films can now be used in abundance to create the types of office spaces that encourage collaboration, productivity, and well-being. Lintec of America offers architects, designers, and printers a variety of eco-friendly printable materials for corporate glass designs. Now, optically clear printable media are available for use in UV ink jet printers. These materials can be used to create unique privacy rooms, conference rooms, doorways, and other areas. Designs created with these materials can be made permanent or removable depending on your needs and specifications. Contact us for more information about our optically clear materials or visit our products page.